Can the stars align for a chance to redefine transportation and land use policies in Los Angeles so that how and where we live, work and move mutually reinforce a shift towards a more inclusive and sustainable city? For much of the past decade, planning in Los Angeles seemed uninspired, not up to the task of a city and region with an expanding transit system, a need for more affordable housing and cleaner air, and a diverse population of immigrants who use space in creative ways and young people who value urban energy and living. The planning department was understaffed, focused on processing individual development applications. The politics of land use and the content of the City’s community plans were still caught in the stale undertow of a receding slow growth movement. The City’s Department of Transportation continued to prioritize driving, widening roads, and was too timid to embrace high quality bicycle infrastructure. Sometime in the last few years, accelerating in the last few months, the conversation around mobility and land use pivoted from the past to the future. The Planning Department is accelerating updates of community plans; revising the mobility and housing elements to the general plan; adding a new health and wellness element. This week, Planning will start fully rewriting the zoning code for the first time since 1946. The Department of Transportation is moving in the direction of complete streets with more bike and pedestrian enhancements. The city and Metro are studying how to integrate transit into our urban fabric. Walking in L.A. has gone from a mark of desperation to one of hipness and health. Los Angeles has also just elected a new mayor and majority of the City Council. With new leadership and a sense of momentum, how can transportation and land use policies be aligned for a more green, appealing and just Los Angeles? To advance this discussion, I will discuss a concept to divide Los Angeles into six zones: parks, hills, homes, boulevards, centers, and industry. Each zone has a “preferred” mode of transportation, by which I mean a form of getting around that can be reinforced by land use regulations to create a positive feedback loop between the built environment and mobility. The overall goal is a Los Angeles that is more sustainable, healthy, affordable, economically thriving and socially integrated. Today, I’ll focus on Parks. The Los Angeles region has long drawn visitors and new residents attracted in part by its climate and recreational opportunities. Open space and farm land in the coasts, plains, mountains and deserts of Southern California may once have seemed inexhaustible. But by the 1960s, a report to California Governor Pat Brown described the Los Angeles Basin as “1,500 square miles of low grade, monotonous suburban construction” with few opportunities for open space preservation outside of some foothill and mountain areas. Decades of private, speculative development and a lack of vision by public municipalities helped Los Angeles squander much of its natural heritage. A housing boom in the 1920 built many homes but few subdivisions set aside land for parks or recreation. The City of Los Angeles built some fine public parks but not enough to keep up with its population boom. The 1930 Olmstead- Bartholomew Plan for Parks, Playgrounds and Beaches for Los Angeles recommended establishing local and regional parks, public ownership of beaches, and a network of parkways and natural reserves. Unfortunately, the plan was not pursued by its sponsors in the Chamber of Commerce or by the City or County. Even when the City planned for land preservation it was hard to maintain farmland or open space. The 1944 plan for the San Fernando Valley was designed to allow the construction of hundreds of thousands of new homes, but would have concentrated dwellings in “country towns” surrounded by “citrus and farm greenbelts.” Builders preferred to buy cheaper farm lands and lobby for these areas to be rezoned for residential development, and the County Assessor would often levy agricultural land at a value that reflected its potential for subdivision, putting additional pressure for conversion. Today, the Trust for Pubic Lands Parkscore analysis ranks Los Angeles 34th out of the nation’s 50 largest cities in terms of meeting its residents needs for parks. L.A. fares poorly on access to parks, spending on parks, and horribly (1 out of possible 20 points) on the number of playgrounds per capita. Until recently, much park spending in the City has gone to maintain older parks rather than create new one, leaving many lower income neighborhoods with larger number of children with less park space per person than older, wealthier areas of LA. Increasing the street tree canopy is more essential now than ever to reduce LA’s heat island effect and counteract the 4-5 degree temperature rise from climate change that the Los Angeles region is expected to experience by mid century http://c-change.la/temperature/. The City’s tree canopy is currently below national average, with less cover in low-income areas. Los Angeles should accelerate installation of street trees, perhaps funded by a fee on atmosphere-destructive and heat-inducing land uses such as surface parking lots and dark-colored roofs. Green streets designed to infiltrate rain and storm water and requirements for water infiltration on private land protect waterways and beaches from runoff, reduce our need for imported water, and can provide a more natural urban environment. The City recently adopted a Low Impact Development Ordinance to require private properties to manage stormwater runoff on site. Ongoing street and sidewalk maintenance and any new street repair bond should rebuild public rights of way (sidewalks, streets, parkways, medians) as permeable surfaces, using natural treatments like bioswales and rain gardens where appropriate. Vacant lots and distressed commercial and residential properties that harm communities through visual blight, crime, and depressed property values can become pocket parks to transform “Redfields to Greenfields.” As referenced above, lower income areas that may have more foreclosed homes and empty commercial lots are frequently park-poor. The City should acquire and vacant or distressed properties for use as temporary or permanent parks where the need for neighborhood open space is greatest. Flood control and power distribution channels can be used as recreation and open space corridors, following the model of L.A. river transformation. Many of the City’s 900 miles of alleys could be greened through traffic calming, landscaping, water infiltration and urban agriculture designs and recreational programs. Los Angeles could reset its street standards for all alleys and/or create a ‘green alley overlay zone’ to help encourage alley improvement in parts of the City, or create a network of pedestrian paths and bikeways. 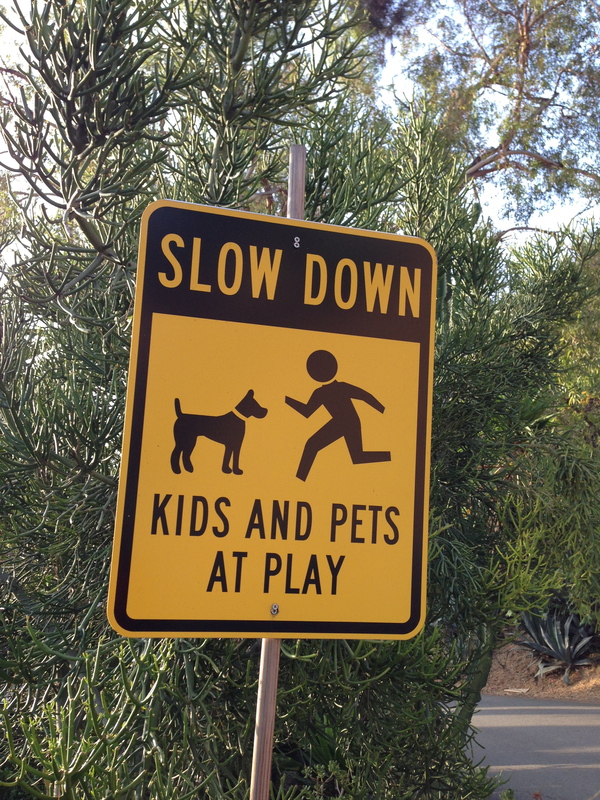 Neighborhood streets are also potential sites for recreational opportunities. Parts of streets can be regularly closed to traffic as “play streets”. By taking half the width of part of a residential block, some streets could become permanent playgrounds to help rectify LA’s glaring need for more paces for kids to play. 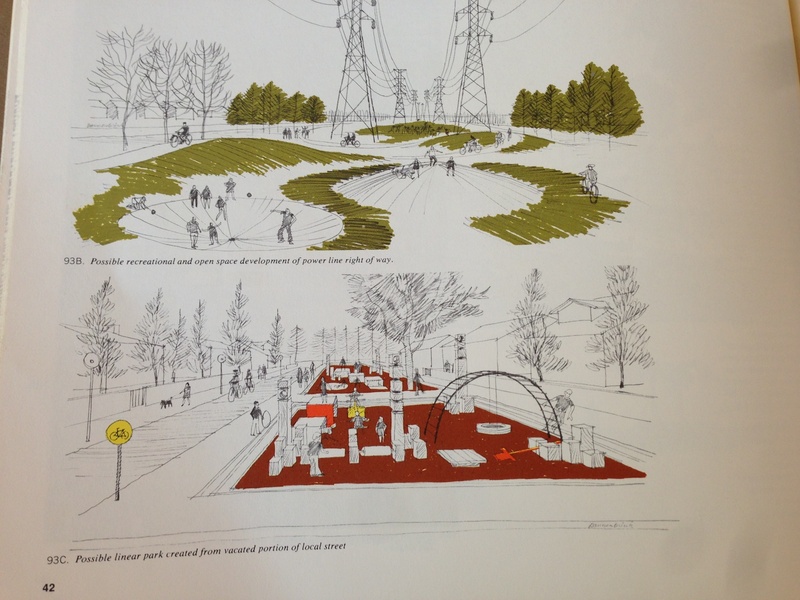 This groovy concept sketch is from the City Planning Department’s 1971 report The Visual Environment of Los Angeles. Commercial streets with lots of pedestrian activity are ideal spots for parklets, plazas and parks. The City should continue to expand the number of street plazas and parklets. As transit and bike infrastructure increases, parts of Los Angeles’ extra wide commercial boulevards could be dramatically reduced in width or closed entirely to vehicle traffic to create linear parks. Urban freeways damage public health and cut communities off from recreational opportunities. There are several proposals to cap freeways in and around the City of Los Angeles to create park space on top of the freeway, including Park 101 near downtown LA, Hollywood Central Park, two cap parks over the 10 in Santa Monica and Space 134 in Glendale. I view freeway removal as a future priority for the Los Angeles region with stubs like the 2 South and 710 North as low-hanging fruit, and freeway removal in densely populated areas as the ultimate prize. Finally, while finding new space for parks is important, we should remember that the greenest thing a city can do probably isn’t creating more open space, but increasing walkable density near transit to reduce driving and energy use. Super interesting and comprehensive. Almost reads like Reyner Banham but updated for 2013. Very much looking forward to the next one. I think the easternmost block of Hollywood Blvd, where it goes as a diagonal from Vermont and Prospect to Sunset and Virgil/Hillhurst, is a natural block to convert to a park. Converting the two ends of the block to parks would create nice pedestrian spaces and greatly ease traffic flow at the complicated intersections they create, while still allowing car access on Rodney and Lyman to the U-Haul and Children’s Hospital parking lots on the center of the block. Some lanes on the middle of the block could probably also be converted to parks once there is much less traffic. U-Haul and Children’s Hospital are in fact two parking lots that probably want to open up onto a very quiet street rather than a major thoroughfare as they currently do. Freeway cap parks are expensive to build and maintain, the surface treatments are limited by structure depth, and the width of the corridor means that the barrier between neighborhoods still exists. I lived in Boston during and after the construction of the ultimate cap park on the Big Dig. Functionally, the North End still feels very separate from the rest of the city. Buildings are what would reconnect things, and to the extent it’s happened on Causeway St, that street looks and feels much better. However, this has taken 10 yrs after project completion, and all of the other parcels are stalled due to the high costs of building over a highway. The 101 downtown, the 110 downtown, the 134 in Glendale, and the 10 in Santa Monica are all great candidates for overbuilds, if the private sector is interested in doing them. However, given the lack of intensity of development at all those locations (other than maybe the 110), I think private interest may be scant. We have a limited amount of public money to spend on parks. Freeway caps are great if you want to cut the ribbon on a huge capital project without really worrying about how successful the space will be. But we could probably do a lot more for more people if we spend public dollars elsewhere. Zoning a Healthier Los Angeles?